Surrounded by nature in an exclusive section of Montevideo, four star Melia Confort Hotel is situated in the beautiful and peaceful neighbourhood of Punta Carretas, only three kilometers from downtown Montevideo and 15 kilometers from the international airport. The Atlantic Ocean is just a few blocks from the hotel and there is a golf course across the street. The 11-floor hotel features 74 well-equipped and comfortable bedrooms, all with a variety of up-to-date facilities. 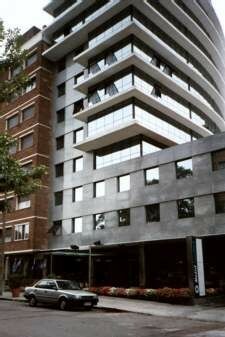 The Melia Confort Montevideo has its own restaurant offering an exquisite Spanish cuisine and comfortable seating. There is also an elegant lobby bar providing the perfect combination of warmth and privacy, and at the fitness club you can enjoy drinks and a snack while taking in an unforgettable panoramic view of the city. Hotel amenities include: air-conditioning, a health and fitness club with a solarium, hydro massage, and sauna. There is also a business center with email and internet access, and audio visual facilities. The hotel also has an excellent center for meetings and events, with a capacity up to 120 people. It has two meeting rooms, and offers a sophisticated and complete line of equipment and services. Far from traffic jams, yet close to the city center, Melia Confort Montevideo is the ideal place for executives and travelers alike, offering a perfect balance between work and pleasure.